Finding the Sign, °, and ′ on the M.C. for a Given Asc. Finding the Calendar Date From the Minor-Progressed M.C. Finding the Zodiacal Motion of Minor-Progressed M.C. or Asc. Finding the Motion by Declination of Major, Minor or Transit-Progressed M.C. or Asc. MINOR progressed aspects have two distinct influences. They exert a power, and a harmony or discord, 1/27.3 of the power and harmony or discord of the same aspect between the same two planets when made by major-progressed aspect. The psychokinetic power of the thought cells receiving new energy through minor-progressed aspects thus enables them to attract into the life minor events. Minor events coincide with characteristic minor-progressed aspects. But in addition to this independent influence, if the minor-progressed aspect is to one of the terminals (as both birth-chart and progressed positions are terminals, unless a planet aspects its birth-chart place each progressed aspect has four terminals) of a major-progressed aspect, it steps up, and thus reinforces the major-progressed aspect. So far as effects are concerned, it seems to operate on the major-progressed power as an automobile induction coil operates in stepping up the battery current to sufficient voltage to afford the spark necessary for ignition. And for a major-progressed aspect to gain enough power to attract a major event it would seem that it is as necessary for it to be thus reinforced by a minor-progressed aspect to one of its four terminals as it is for an automobile to have its battery current stepped up by an induction coil to get satisfactory ignition. Church of Light statistical studies of the major and minor-progressed aspects in many hundreds of charts at the time some major event took place demonstrate that major events take place only when the characteristic major-progressed aspect is thus reinforced by a minor-progressed aspect. These statistical studies indicate that this reinforcement effect seems to have no influence whatever on the harmony or discord of the major-progressed aspect. But it does apparently step up whatever power the major-progressed aspect has at the time by the same percentage a similar major-progressed aspect steps up the birth-chart power of the planets involved. Thus during the time a major-progressed aspect is within its one effective degree of orb there are sure to be several lesser periods during which minor-progressed aspects step it up. And whatever major event occurs is sure to happen on one of these peaks of power. RULE: The Major-Progressed Constants of an event or disease are always reinforced by a minor-progressed aspect heavier than from the Moon to one of its four terminals at the time the event occurs or the disease develops. This rule is very important, for it enables us to eliminate the possibility of a given event or the development of a given disease, even during those periods when the Major-Progressed Constants are within the one degree of effective orb, except during those limited periods when ALL these Major-Progressed Constants are reinforced by minor-progressed aspects. But thus to be sure they are eliminated during a given period, not only the zodiacal minor-progressed position of the ten planets and the M.C. and Asc. must be precisely ascertained, but the declinations also of all twelve minor-progressed positions. Using a Lunar Constant for such calculations may give an error of from one to three days, which is not significant in timing minor events. But during three days minor-progressed Sun, Mercury and Venus may each move not less than 15′. Thus this margin of error may make it appear that they are not within orb of an aspect when in reality they are. And should an individual undertake some dangerous exploit during a heavy discordant major-progressed aspect involving Mars, under the impression there was no minor-progressed aspect within one degree of perfect involving Mars, when in reality there thus was, this error might cost him his life. Or the error may indicate that there is a minor-progressed aspect within one degree of orb to the terminal of a major-progressed aspect when in reality there is not. On the assumption the minor-progressed aspect is thus exerting reinforcing power, an individual under the influence of some favorable major-progressed aspect may undertake some venture and fail, in which he would have been successful had the minor-progressed aspect actually been within the one degree of effective orb. 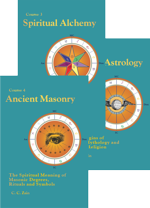 Thus on certain occasions it is essential to be able to determine quite precisely when a minor-progressed aspect is, and when it is not, within the one degree of effective orb to a birth-chart or major-progressed position. The above rule enables us more precisely to time indicated events; for the event will occur on one of the peaks of power indicated when ALL the Major-Progressed Constants are reinforced by minor-progressed aspects. As indicated on page of Chapter 8 (Serial Lesson 117), it greatly aids in rectifying charts; because if the chart is correct it will have not only a major-progressed aspect to the ruler of the house mapping the department of life affected by the event, and the Major-Progressed Constants of the event—often involving the rulers of several houses—at the time the event occurs, but as an additional check, the major-progressed aspect indicating the event in each case must be reinforced by a minor-progressed aspect and released by a transit aspect. If the ruler of the house mapping the department of life affected by the major-progressed aspect, and each of the other Major-Progressed Constants, are not thus reinforced by a minor-progressed aspect and released by a transit-progressed aspect at the time of the event, the house positions of the chart are not correct. There are still other important applications of the rule given above, but undoubtedly its greatest usefulness is in the selection of the best time to do things. Commonly, minor-progressed aspects last only a short period. Therefore, during the time a major-progressed aspect is within its one degree of effective orb, it usually is possible to select several short periods during which no minor-progressed aspect to any of its terminals reinforces it. If one were compelled to do something hazardous, such as take a dangerous trip, during the time there was an unfavorable major-progressed aspect involving Mars, if one selected a time when this major-progressed aspect was not reinforced by a minor-progressed aspect, the danger would be reduced, if not to nil, at least to a minimum. Thus far in analyzing several hundred accidents we have found none unless a major-progressed aspect involving Mars was reinforced by one or more minor-progressed aspect. On the other hand, if one wished to do something at a time when it was essential to get all the benefit possible from a favorable major-progressed aspect, one could select a time when several minor-progressed aspects were reinforcing the major-progressed aspect. Often it is possible to find a short period during which the reinforcements give the major-progressed aspect several times its normal peak power. The power to bring the desired event to pass during such a short period would consequently be much more than when no reinforcement was present. Most major events do not drop unheralded out of the blue. Commonly there are preliminary minor occurrences leading up to the major event, and after the major event is past quite frequently there are minor occurrences resulting from it. The minor events leading to, and resulting from, a major event are indicated and timed by minor-progressed aspects involving one or more of the terminals of the major-progressed aspect indicating the major event. This knowledge may be quite valuable in anticipating the kind of major event that is approaching, and in anticipating the time certain conditions developing from it will occur. Experience proves that the aspects among themselves of minor-progressed planets afford so little energy that their influence should be neglected. Any calendar time interval can be converted into minor-progressed time interval, and any minor-progressed time interval can be converted into calendar time interval, at the rate of 27.3 days minor progression time being equivalent to one year of calendar time, and 360° movement of the Moon by minor progression being equivalent to one year (365.25 days) of calendar time. The ephemeris Moon thus moves by minor progression approximately 1 degree a day. To be precise, the minor-progressed Moon moves exactly the same number of degrees and minutes as the transiting Sun. Thus the zodiacal distance between the birth-chart Sun and the birth-chart Moon is at all times the precise zodiacal distance between the minor-progressed Moon and the transiting Sun. Therefore, from the transiting Sun—the position of the Sun in the ephemeris on any given calendar date—the position of minor-progressed Moon may easily be found, and from the position of the minor-progressed Moon the minor-progressed positions of the other planets may be ascertained. And from the position of the minor-progressed Moon when any minor-progressed aspect is formed the transiting position of the Sun may easily be found, and from the transiting position of the Sun, by looking in an ephemeris for this position of the Sun, the calendar day the minor-progressed aspect is formed can be ascertained. If desired, by calculating the time on that day when the Sun reaches the precise ′ of the indicated position, the time on that calendar day when the aspect is formed also can be ascertained. The zodiacal distance between the birth-chart Moon and the birth-chart Sun, used in these calculations, is called the Solar Constant. The Solar Constant (abbreviated S.C.) is the zodiacal distance in the chart of birth between the Moon and the Sun in signs, °s, and ′s, expressed as plus or minus, so that when added to the sign, °, and ′ occupied by the Moon, the algebraic sum gives the sign, °, and ′ occupied by the Sun. To find the Solar Constant, from the larger zodiacal longitude in signs, °s and ′s occupied by the Sun or Moon in the birth chart, subtract the smaller zodiacal longitude in signs, °s and ′s occupied by Sun or Moon in the birth chart. Place before the signs, °s and ′s so found the plus or minus sign indicating whether these are to be added to, or subtracted from, the place occupied by the Moon to ascertain the place occupied by the Sun. Then, wherever the Moon may be by minor progression, algebraically add the sign, °, and ′ it occupies to the S.C. and the result is the sign, °, and ′ occupied by the transiting Sun as shown in the ephemeris for that calendar year. The time of day the Sun reaches this ° and ′ can then be calculated. Wherever the Sun may be at any time of day on any day of the calendar year, change the algebraic sign before the S.C. and add it to the sign, °, and ′ occupied at the time of day on that calendar date by the Sun, and the result is the sign, °, and ′ occupied by the minor-progressed Moon on that calendar date. Each calendar year of 365.25 days is equivalent to 27.3 days of ephemeris time (minor progression time), which is the time it takes the minor-progressed Moon to complete the cycle though all the 12 zodiacal signs and return to the sign, °, and ′ it occupied in the birth chart. The Minor Progression Date (abbreviated Mip. 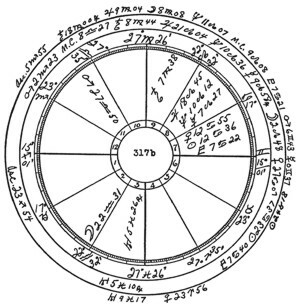 D.)—the ephemeris date on which the minor-progressed Moon again occupies the sign, °, and ′ it occupied in the birth chart—for any calendar year may be found by counting ahead in the ephemeris as many returns of the Moon to the sign, °, and ′ it occupies in the chart of birth as years of life have elapsed since birth. Or, multiply the number of years that have elapsed since birth by 27.3. Then divide the product by 365 (number of days in a year) and call the quotient years. Divide the remaining days by 30 and call the quotient months. The number of years, months and days thus ascertained for each year after birth up to 96 years are given in the Minor Progression Date Table (see below) on pages and . Then to the year, month and day of birth, add the years, months and days of the minor-progressed interval thus ascertained. This will give the approximate ephemeris date of the Mip. D. Move forward or backward in the ephemeris from this approximate Mip. D. until the ephemeris shows the Moon in the sign, °, and ′ it occupies in the birth chart. This ephemeris day is the Minor Progression Date. The Minor Ephemeris Date (abbreviated MED) is the date in the ephemeris from which the minor-progressed positions of the planets are calculated, or on which the minor-progressed planets make aspects to the birthchart or major-progressed positions. Inspection of the ephemeris will show the MED on which the minor-progressed planets make aspects to birth-chart or major-progressed positions. To find the MED on which to calculate the minor-progressed positions of the planets for any calendar date, after changing the sign before the S.C., algebraically add it to the sign, °, and ′ occupied by the transiting Sun on that calendar date at the time of day for which the minor-progressed positions are required. This gives the sign, °, and occupied by the minor-progressed Moon on that calendar date and at that time of day. Then find the approximate Mip. D. for that calendar year. If the calendar date is before the birthday of that year, move back in the ephemeris from the approximate Mip. D. until the Moon is found in the indicated sign, °, and ′. If the calendar date is after the birthday of that year, move ahead in the ephemeris from the approximate Mip. D. until the Moon is found in the indicated sign, °, and ′. The ephemeris date so located is the MED. First find the sign, °, and ′ occupied by the transiting Sun on the given calendar date, and for the precise time of day, just as it is found in erecting a birth chart for the day and time of day of birth. Then, as above explained, use the S.C. to find the precise sign, °, and ′ occupied by the minor-progressed Moon for this calendar date and time of day. From this, as previously explained, find the MED for this calendar date. Find (a) the daily motion of the planet in °s, and ′s on the MED. Find (c) the daily motion of the Moon in °s and ′s on the MED. Find (d) the °s and ′s the sign, °, and ′ occupied by the minor-progressed Moon on the calendar date and time of day, as above found, is from the sign, °, and ′ occupied by the Moon on the MED. By proportion, reduce (a), (c) and (d) to ′s. Multiply (d) by (a) and divide the product by (c). This gives (b), the distance in ′s the planet is from its MED position. By logarithms, add log. (a) to log. (d), and from the sum subtract log. (c). The result is log. (b), the °s and ′s the planet has moved from its MED position. If the position of the minor-progressed Moon for the given calendar date is less than its position on the MED and the planet is retrograde, add the °s and ′s so found to its MED position. If the position of the minor-progressed Moon is less than its position on the MED and the planet is direct in motion, subtract the °s and ′s so found from its MED position. If the position of the minor-progressed Moon is greater than its position on the MED and the planet is retrograde in motion, subtract the °s and ′s so found from its MED position. If the position of the minor-progressed Moon is greater than its position on the MED and the planet is direct in motion, add the °s and ′s so found to its MED position. This gives the minor-progressed position of the planet on the given calendar date. For the minor-progressed declination of the planet, for (a) use its daily motion by declination, and find (b), the °s and ′s it is by declination from its MED position just as the °s and ′s from its zodiacal MED position were above found. Example 1. For the chart 317b, given on page , calculate all the minor-progressed positions for January 19, 1932. The first step in all minor-progressed calculations is to find the Solar Constant. Subtracting the position of birth-chart Sun, 4S 12° 36′, from the position of birth-chart Moon, 11S 22° 31′, gives the Solar Constant as 7S 9° 55′. The second step in finding minor-progressed positions is to find the position of minor-progressed Moon for the calendar date. Turning to January 19, 1932, in the ephemeris we find the transiting Sun at Greenwich noon 10S 28° 13′. Changing the algebraic sign before the S.C. we add its 7S 9° 55′ to the transiting Sun, 10S 28° 13′. This gives the position of minor-progressed Moon as 6S 8° 08′. The third step in finding minor-progressed positions is to find the approximate Minor Progression Date. 1932 is 12 years after birth. We look on the Minor Progression Date Table, page , and find for 12 years of age 00y 10m 28d. Adding this to date of birth, 1920y 7mo 4d, gives the approximate Mip. D. as June 2, 1921. The fourth step in finding minor-progressed positions is to find the MED. As Jan. 19 is before the birthday in 1932, we move back in the ephemeris from the approximate Mip. D. until we find the Moon near 8 Virgo 08. The MED is thus May 15, 1921, which shows the Moon 5 Virgo 21 and moving (c) 13° 55′. The daily motion of the Sun on May 15, 1921, is (a) 58′. By proportion, multiplying (d) 167 by (a) 58 gives 9686. Dividing 9686 by (c) 835 gives (b) 12′. By logarithms, adding log. (a) 1.3949 to log. (d) .9356 gives 2.3305. Subtracting log. (c) .2367 from 2.3305 gives 2.0938, which is the log. of (b) 12′. Adding the 12′ found by either method to the position of the Sun in the ephemeris on May 15, 1921, gives the minor-progressed position of the Sun at Greenwich noon for calendar date Jan. 19 1932, as 24 Taurus 18. The daily motion of Mercury on May 15, 1921, is (a) 2° 09′. By proportion, reducing the 2° 09′ gives (a) 129′. Multiplying (d) 167 by (a) 129 gives 21543. Dividing 21543 by (c) 835 gives (b) 26′. By logarithms, adding log. (a) 1.0478 to log (d) .9356 gives 1.9834. Subtracting log. (c) .2367 from 1.9834 gives 1.7467, which is the log. of (b) 26′. Adding the 26′ found by either method to Mercury’s position in the ephemeris on May 15, 1921, gives the minor-progressed position of Mercury at Greenwich noon on calendar date Jan. 19, 1932, as 00 Gemini 37. Thus on May 15, 1921, the Moon is decreasing in declination (a), 4° 26′. By proportion, reducing 4° 26′ gives (a) 266′. Multiplying (d) 167 by (a) 266 gives 44422. Dividing 44422 by (c) 835 gives (b) 53′. By logarithms, adding log. (a) .7335 to log. (d) .9356 gives 1.6691. Subtracting log. (c) .2367 from 1.6691 gives 1.4324, which is the log. of (b) 53′. Subtracting (as declination is decreasing) the 53′ found by either method from the Moon’s declination in the ephemeris on May 15, 1921, gives the minor-progressed declination of the Moon at Greenwich noon on calendar date Jan. 19, 1932, as 4 N 51. Example 2. For the chart 317b, find minor-progressed M.C. and Asc. for Jan. 19, 1932. The Midheaven Constant (M.C.C.) for this chart, found according to the method given in Chapter 2 (Serial Lesson 111), is minus 2S 14° 50′. Therefore to find the minor-progressed M.C., as explained in Chapter 2, change the algebraic sign of the M.C.C. and add its 2S 14° 50′ to the minor-progressed position of the Sun as above found, 2S 24° 18′. This gives minor-progressed M.C. at Greenwich noon on Jan. 19, 1932, as 9 Leo 08. Using the method given in Chapter 2, it is found that when 9 Leo 08 is on the M.C. in latitude 30N., 5 Scorpio 55 is on the Asc. Therefore, at Greenwich noon on calendar date Jan. 19, 1932, minor-progressed Asc. is 5 Scorpio 55′. Find the MED in the ephemeris nearest the ephemeris time the aspect is perfect. If a major-progressed position is involved, find the major-progressed position for the calendar date represented by the MED. Find its major-progressed travel during the number of days represented by the movement of the minor-progressed Moon on the MED. This is from 12 to 15 days of calendar time, as indicated by the Moon during the MED moving from 12 to 15 degrees. Find (a) the gain in °s and ′s of the minor-progressed planet on the major-progressed planet during the calendar interval represented by the MED. If the aspect is to a birth-chart position, (a) is the daily travel of the minor-progressed planet on the MED. Find (b) the °s and ′s the aspect is from perfect on the calendar date represented by the MED. Find (c) the °s and ′s the Moon travels on the MED. By proportion, reduce (a), (c) and (b) to ′s. Multiply (c) by (b) and divide the product by (a). This gives (d), the distance in ′s the minor-progressed Moon is from its position on the MED when the aspect is perfect. By logarithms, add log. (b) to log. (c), and from the sum subtract log. (a). The result is log. (d), the °s and ′s the minor-progressed Moon is from its position on the MED when the aspect is perfect. From the sign, °, and ′ thus occupied by the minor-progressed Moon when the aspect is perfect, use the S.C. to find the sign, °, and ′ occupied by the transiting Sun on the calendar date the aspect is perfect. If it is desired to know the time of day the minor-progressed aspect is perfect on that calendar day, calculate the time of day in the manner explained in Chapter 7 (Serial Lesson 116). Example 3. For chart 317b, find during calendar year 1932 when minor-progressed Sun is sextile Venus p. The chart on page shows the position of major-progressed Venus on Jan. 19, 1932, as 27 Cancer 07. Looking back in the ephemeris from the approximate Mip. D. for 1932 (June 2, 1921), we find the Sun on May 18 in 26 Taurus 59 and thus near sextile Venus p. On this MED the Moon is 16 Libra 29. Subtracting the S.C. 7S 9° 55′ from 7S 16° 29′ gives the transiting position of the Sun on the MED as 12S 6° 34′. Looking in the 1932 ephemeris we find the Sun 6 Pisces 42 on Feb. 26, 1932. Calculating major-progressed Venus according to the method given in Chapter 2 (Serial Lesson 111), gives its position on Feb. 26, 1932, as 27 Cancer 15. During the 13 days, movement of the Moon on the MED, calculated by the method given in Chapter 2, Venus moves 3′. Subtracting this 3′ from the 58′ the Sun moves on May 18, 1921, gives the gain (a) 55′. By proportion, reducing 13° 19′ gives (c) 799′. Multiplying (c) 799 by (b) 16 gives 12784. Dividing 12784 by (a) 55 gives (d) 232′ or 3° 52′. By logarithms, adding log. (b) 1.9542 to log. (c) .2558 gives 2.2100. Subtracting log. (a) 1.4180 from 2.2100 gives .7920, which is the log. of (d) 3° 52′. Adding the 3° 52′ found by either method to the position of the Moon on May 18, 1921, gives the minor-progressed position of the Moon 20 Libra 21. From this 7S 20° 21′ subtract the S.C. 7S 9° 55′ and it gives the position of transiting Sun 10 Pisces 26. 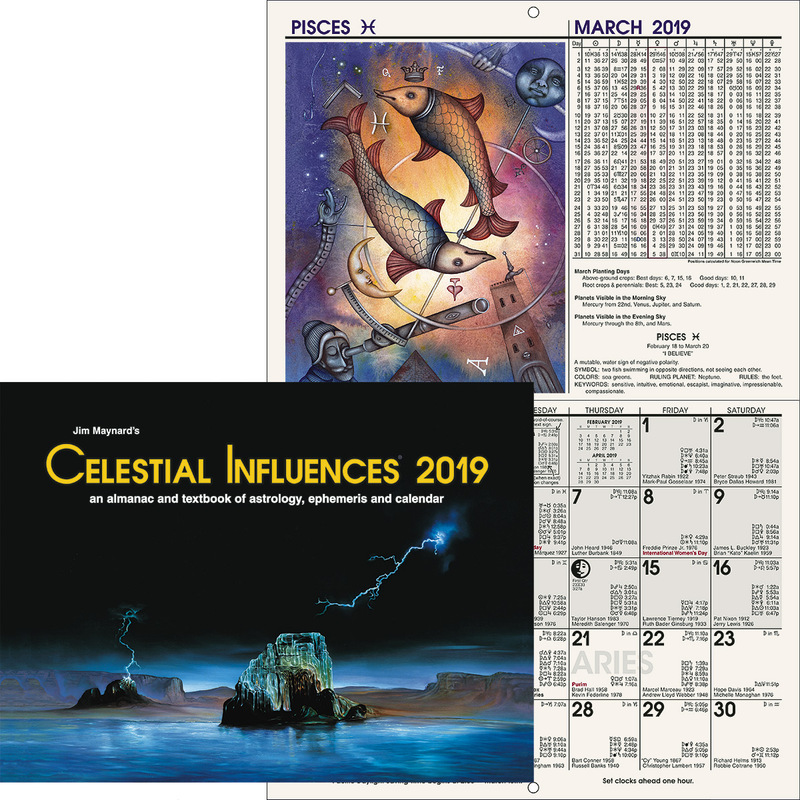 Turning to an ephemeris for the year 1932 we find the Sun 10 Pisces 43, less than 12 hours’ movement from the required position, on March 1, 1932. Thus Sun m is sextile Venus p March 1, 1932. Example 4. For chart 317b, find during the calendar year 1932 when minor-progressed Sun is sesquisquare birth-chart Mars. The chart on page shows Mars r 27 Libra 50. For the sesquisquare the Sun m can move to 12 Gemini 50. Looking in the ephemeris from the approximate Mip. D. for 1932 (June 2, 1921), we find the Sun on June 3, 1921, in 12 Gemini 20. On this MED the Sun moves (a) 57′. It lacks (b) 30′ of the aspect. The Moon moves daily (c) 13° 44′. By proportion, reducing 13° 44′ gives (c) 824′. Multiplying (c) 824 by (b) 30 gives 24720. Dividing 24720 by (a) 57 gives (d) 434′ or 7° 14′. By logarithms, adding log. (b) 1.6812 to log. (c) .2424 gives 1.9236. Subtracting log. (a) 1.4025 from 1.9236 gives .5211, which is the log. of (d) 7° 14′. Adding the 7° 14′ found by either method to the position of the Moon June 3, 1921, gives the minor-progressed position of the Moon 13 Taurus 21. From this 2S 13° 21′ subtract the S.C. 7S 9° 55′ and it gives the position of transiting Sun as 7S 3° 26′. Turning to an ephemeris for 1932 we find the Sun 3 Libra 11, and thus less than 12 hours’ movement from the required position on Sept. 26, 1932. Thus Sun m is sesquisquare Mars r Sept. 26, 1932. Find the MED in the ephemeris nearest the ephemeris time the aspect is perfect. Find the sign, °, and ′ of minor-progressed M.C. or Asc. on the calendar date represented by this MED. If a major-progressed position is involved, find its major-progressed position for the calendar date represented by the MED. Find its major-progressed travel during the number of days represented by the movement of minor-progressed Moon on the MED. This is from 12 to 15 days calendar time, as indicated by the Moon on the MED moving from 12 to 15 degrees. Find (a) the gain in °s and ′s of the minor-progressed M.C. or Asc. on the travel of the major-progressed position during the calendar interval represented by the MED. If the aspect is to a birth-chart position, (a) is the travel of minor-progressed M.C. or Asc. on the MED. Then proceed as if the aspect were being made by a minor-progressed planet as previously explained. Example 5. For chart 317b, find during the calendar year 1932 when minor-progressed M.C. is sextile Mars p. The chart on page shows major-progressed Mars on Jan. 19, 1932, in 2 Scorpio 23. To reach the sextile M.C. must be more than 2 Virgo 23. From 6S 2° 23′ subtract the M.C.C. 2S 14° 50′ and it gives Sun m as 17 Gemini 33. Looking ahead from the approximate Mip. D. (June 2, 1921) we find the Sun on June 8, 1921, in 17 Gemini 08. This is the MED. To this 3S 17° 08′ add the M.C.C. 2S 14° 50′ and it gives the position of M.C. m on the MED as 1 Virgo 58. On this MED the Moon is 18 Cancer 04. Subtracting the S.C. 7S 9° 55′ from 4S 18° 04′ gives the transiting position of the Sun on the MED as 9S 8° 09′. Looking in the 1932 ephemeris we find the Sun 8 Sagittarius 06 on Nov. 30, 1932. Calculating major-progressed Mars according to the method given in Chapter 2 (Serial Lesson 111) gives Mars p on Nov. 30, 1932, in 2 Scorpio 45. During the 15 days movement of the Moon on the MED, calculated according to the method given in Chapter 2, Mars moves 1′. The M.C. moves the same distance as the Sun on the MED. On June 8, 1921, it moves 57′. Subtracting the 1′ Mars moves from the 57′ gives the gain as (a) 56′. By proportion, reducing 14° 49′ gives (c) 889′. Multiplying (c) 889 by (b) 47 gives 41783. Dividing 41783 by (a) 56 gives 746′ or 12° 26′. By logarithms, adding log. (b) 1.4863 to log. (c) .2095 gives 1.6958. Subtracting log. (a) 1.4102 from 1.6958 gives .2856, which is the log. of (d) 12° 26′. Adding the 12° 26′ found by either method to the position of the Moon June 8, 1921, gives the minor-progressed position of the Moon 00 Leo 30. From this 5S 00° 30′ subtract the S.C. 7S 9° 55′ and it gives the position of transiting Sun 9S 20° 35′. Turning to an ephemeris for the year 1932 we find the Sun 20 Sagittarius 17, less than 12 hours’ movement from the required position, Dec. 12, 1932. Thus minor-progressed M.C. is sextile Mars p Dec. 12, 1932. Example 6. For chart 317b, find during the calendar year 1932 when minor-progressed Asc. is square Neptune r: In example 2 we found minor-progressed Asc. on January 19, 1932, in 5 Scorpio 55. To make the square of Neptune r it must reach 10 Scorpio 12. According to the method given in Chapter 2 (Serial Lesson 111), when 10 Scorpio 12 is on the Asc. in latitude 30N., 14 Leo 08 is on the M.C. From 5S 14° 08′ subtract the M.C.C. 2S 14° 50′ and it gives the position of Sun m when the aspect is perfect as 2S 29° 18′. Looking back in the ephemeris from the approximate Mip. D. we find the Sun on May 21, 1921, in 29 Taurus 52. Thus May 21, 1921, is the MED. By proportion, reducing 12° 54′ gives (c) 774′. Multiplying (c) 774 by (b) 34 gives 26316. Dividing 26316 by (a) 58 gives (d) 454′ or 7° 34′. By logarithms, adding log. (b) 1.6269 to log. (c) .2696 gives 1.8965. Subtracting log. (a) 1.3949 from 1.8965 gives .5016, which is the log. of (d) 7° 34′. Subtracting the 7° 34′ found by either method from the position of the Moon on May 21, 1921, gives the minor-progressed position of the Moon 18 Scorpio 15. From this 8S 18° 15′ subtract the S.C. 7S 9° 55′ and it gives the position of transiting Sun 1S 8° 20′. Turning to an ephemeris for 1932 we find the Sun 8 Aries 35, less than 12 hours’ movement from the required position, March 29, 1932. Thus minor-progressed Asc. is square Neptune r March 29, 1932. Example 7. For chart 317b, find during the calendar year 1932 when minor-progressed Asc. is square Mercury p. The chart on page shows Mercury p on Jan. 19, 1932, in 9 Leo 58R. To reach the square the Asc. must be less than 9 Scorpio 58. When 10 Scorpio 05 is on the Asc. in latitude 30N. the table of houses shows 14 Leo 00 on the M.C. Subtracting the M.C.C. 2S 14° 50′ from 5S 14° 00′ gives the position of minor-progressed Sun 2S 29° 10′. May 20, 1921, the ephemeris shows the Sun 28 Taurus 54. Thus May 20, 1921, is the MED. To the position of the Sun on May 20, 1921, add the M.C.C. 2S 14° 50′ and it gives the position of minor-progressed M.C. on the MED as 13 Leo 44. Calculated according to the method given in Chapter 2 (Serial Lesson 111), when 13 Leo 44 is on the M.C. in latitude 30N. 9 Scorpio 51 is on the Asc. Therefore minor-progressed Asc. on the MED is 9 Scorpio 51. The Moon on the MED is 12 Scorpio 55. From this subtract the S.C. 7S 9° 55′ and it gives the position of transiting Sun 3 Aries 00. The 1932 ephemeris shows Sun in 2 Aries 39 March 23. This is the calendar date corresponding to the MED. 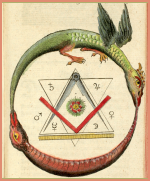 Calculating major-progressed Mercury according to the method given in Chapter 2, gives its position March 23, 1932, as 9 Leo 55R. The aspect is from perfect thus (b) 4′. On the MED, May 20, 1921, the Sun moves 58′, which is also the movement of minor-progressed M.C. While the M.C. moves 60′ from 13 Leo 00 to 14 Leo 00 the Asc. in latitude 30N. moves 51′, and while the M.C. moves 58′ the Asc., calculated according to the method given in Chapter 2, moves 49′. Thus the Asc. on the MED moves 49′, and during the 13 days, movement of the Moon on the MED major-progressed Mercury, calculated according to the method given in Chapter 2, moves 1′. As Asc. is direct in motion and major-progressed Mercury is retrograde, we add the 49′ and the 1′ which gives the gain (a) 50′. By proportion, reducing 12° 54′ gives (c) 774′. Multiplying (c) 774 by (b) 4 gives 3096. Dividing 3096 by (a) 50 gives (d) 62′ or 1° 02′. By logarithms, adding log. (b) 2.5563 to log. (c) .2696 gives 2.8259. Subtracting log. (a) 1.4594 from 2.8259 gives 1.3665, which is the log. of (d) 1° 06′. Adding the 1° 02′ found by either method to the position of the Moon on May 20, 1921, gives the minor-progressed position of the Moon as 13 Scorpio 57. From this 8S 13° 57′ subtract the S.C. 7S 9° 55′ and it gives the position of transiting Sun as 1S 4° 02′. Turning to an ephemeris for the year 1932 we find the Sun in 3 Aries 39, less than 12 hours’ movement from the required position, March 24, 1932. Thus minor-progressed Asc. is square Mercury p March 24, 1932. From the sign, °, and ′ on the minor-progressed M.C. or Asc. find the declination as if it were a birth-chart position, as explained on page of Chapter 3 (Serial Lesson 112). Finding the Motion by Declination of Minor-Progressed M.C. or Asc. Instructions for this are given in Chapter 3 (Serial Lesson 112). In this problem (b) is the °s and ′s the planet, M.C. or Asc. must move from its Map. D., MED, or Transit Date position to reach the given ° and ′. The problem is handled exactly as if the progressing planet, M.C. or Asc. was this number of °s and ′s from making an aspect to a birth-chart position. Find the MED in the ephemeris nearest the ephemeris time the aspect is perfect. If a major-progressed position is involved, find the major-progressed declination for the calendar date represented by the MED. Find the major-progressed travel by declination during the number of days represented by the movement of the minor-progressed Moon on the MED. This is from 12 to 15 days of calendar time, as indicated by the Moon during the MED moving from 12 to 15 degrees. Find the declination in °s and ′s occupied by minor-progressed M.C. or Asc. on the calendar date represented by the MED. Find the minor-progressed travel by declination of the M.C. or Asc. during the MED. Find (a) the gain in °s and ′s of the minor-progressed M.C. or Asc. in declination on the major-progressed position’s travel by declination during the calendar interval represented by the MED. If the aspect is to a birth-chart position, (a) is the travel in declination of minor-progressed M.C. or Asc. on the MED. Example 8. For chart 317 b, find the calendar date in 1932 when minor-progressed Asc. is parallel Mercury p. Major-progressed Mercury, as shown on the Map. D. July 16, 1920, has declination 14 N 13 on Jan. 19, 1932, and is decreasing declination by 8′ per year by major progression. 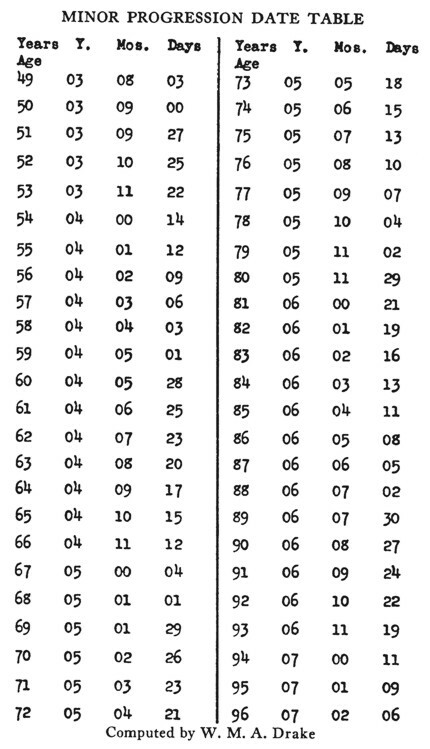 The table on page of Chapter 6 (Serial Lesson 115) shows that to reach declination 14 S 11 the Asc. can be 8 Scorpio 00. A table of houses shows that when 11 Leo 00 is on the M.C. the Asc. in latitude 30N. is 7 Scorpio 31. Thus when the aspect is perfect approximately 11 Leo 30 will be on the M.C. Subtracting the M.C.C. 2S 14° 50′ from 5S 11° 30′ gives the approximate position of minor-progressed Sun 26 Leo 40. Moving back in the ephemeris from the approximate Mip. D. for 1932, June 2, 1921, we find the Sun on May 18, 1921, in 26 Taurus 59. Thus May 18, 1921, is the MED. 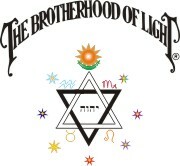 May 18, 1921, the Moon is 16 Libra 29. From 7S 16° 29′ subtract the S.C. 7S 9° 55′ and it gives the transiting position of the Sun on the MED 12S 06° 34′. Looking in the 1932 ephemeris we find the Sun in 6 Pisces 42 on Feb. 26. Calculating the declination of major-progressed Mercury by the method given in Chapter 2 (Serial Lesson 111) gives its position on March 13, 1932, as 14 N 12. It moves less than 1′ during the 14 days, movement of the Moon on the MED. To the position of the Sun on the MED 2S 26° 59′ add the M.C.C. 2S 14° 50′ and it gives minor-progressed M.C. on the MED as 5S 11° 49′. Calculated by the method given in Chapter 2 (Serial Lesson 111), when 11 Leo 49 is on the M.C. in latitude 30N. the Asc. is 8 Scorpio 30. This is its position on the MED. On the MED the Sun moves 58′. This is also the travel of the M.C. on the MED. Calculated according to the method given in Chapter 2, while the M.C. moves 58′ the Asc. moves 50′. 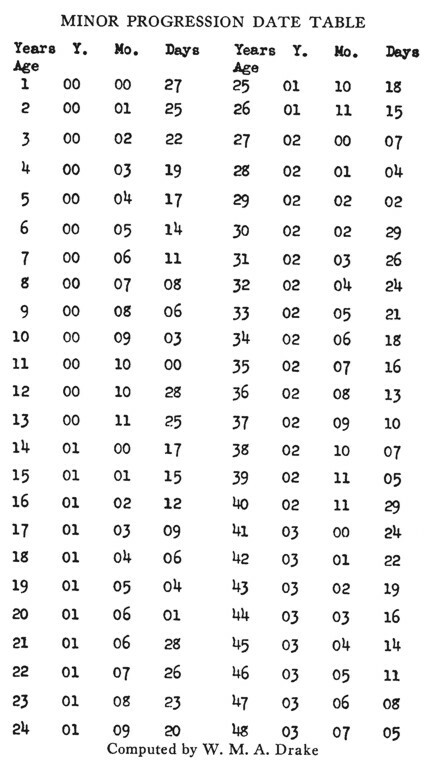 The table on page of Chapter 6 (Serial Lesson 115) shows that when the Asc. in 8 Scorpio 00 moves 60′ the declination moves 19′. Calculated by the method given in Chapter 3 (Serial Lesson 112), 8 Scorpio 30 thus has declination 14 S 21. While the Asc. travels the 50′ on the MED by zodiacal motion, calculated by the same method the Asc. increases declination 16′. This is the travel by declination of minor-progressed Asc. on the MED. As Mercury does not change declination during the MED the gain is (a) 16′. As minor-progressed Asc. on the MED is 14 S 21 increasing in declination, and major-progressed Mercury on the MED is 14 N 12, the aspect is from perfect (b) 9′. On the MED between May 17 and May 18, 1921, the Moon is moving (c) 13° 31′. By proportion, reducing 13° 31 ′ gives (c) 811′. Multiplying (c) 811 by (b) 9 gives 7299. Dividing 7299 by (a) 16 gives 456′ or 7° 36′. By logarithms, adding log. (b) 2.2041 to log. (c) .2493 gives 2.4534. Subtracting log. (a) 1.9542 from 2.4534 gives .4992, which is the log. of 7° 36′. Subtracting the 7° 36′ found by either method from the position of the Moon May 18, 1921, gives the minor-progressed position of the Moon when the aspect is perfect as 8 Libra 53. From this 7S 8° 53′ subtract the S.C. 7S 9° 55′ and it gives the position of transiting Sun as 11S 28° 58′. Turning to an ephemeris for 1932, we find the Sun 11 Aquarius 38, less than 12 hours’ movement from the required position, on Feb. 18, 1932. Thus Asc. m is parallel Mercury p Feb. 18, 1932. Example 9. For chart 317b, find the calendar date in 1932 when minor-progressed M.C. is parallel Jupiter p. Major-progressed Jupiter, as shown by the Map. D. July 16, 1920, has declination 15 N 15 and decreasing 4′ per year by major progression. When 18 Leo 00 is on the M.C. the declination of M.C. is 15 N 26, and decreasing 19′ while M.C. moves 60′. When 18 Leo 30 is on M.C. minor-progressed Sun is 3 Gemini 40, which gives the MED May 25, 1921, with Sun 3 Gemini 43. May 25, 1932, the Moon is 15 Capricorn 23. Subtracting from this the S.C. gives calendar date for MED May 26, 1932. Major-progressed Jupiter on May 26, 1932, has declination 15 N 14 and moves less than 1′ during the 12 days, interval of the MED. minor-progressed M.C. on the MED is 18 Leo 33 with declination 15 N 16. The aspect is from perfect (b) 2′. minor-progressed M.C. on the MED moves 58′ by zodiacal motion and decreases declination 18′. As Jupiter does not change declination the gain is (a) 18′. Solving from this point on as if the aspect were being made by a minor-progressed planet we find minor-progressed M.C. parallel Jupiter p May 28, 1932. Minor progressions outside chart for Jan. 19,1932. 1932, Feb. 18: Asc. m parallel Mercury p.
1932, March 1, Sun m sextile Venus p.
1932, March 24, Asc. m square Mercury p.
1932, March 29: Asc. m square Neptune r.
1932, May 28: M.C. m parallel Jupiter p.
1932, Sept. 26: Sun m sesquisquare Mars r.
1932, Dec. 12: M.C. m sextile Mars p.